The next year was not a repeat performance unfortunately. 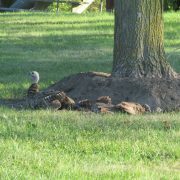 We have a rock pile close by the garden which is home to a family of ground hogs (they were present the first year). 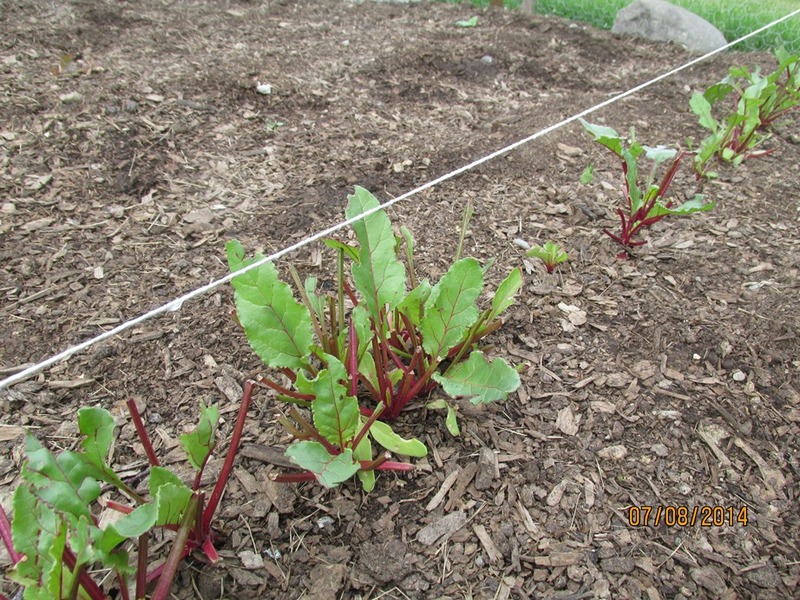 For some reason, they began to take an interest in the tender shoots coming up and completely demolished all of the lettuce, radish, bean, pea, spinach, swiss chard and beets greens as soon as they were identifiable. Ouch…my hard work destroyed overnight! Ok – it was early enough in the season to start again. 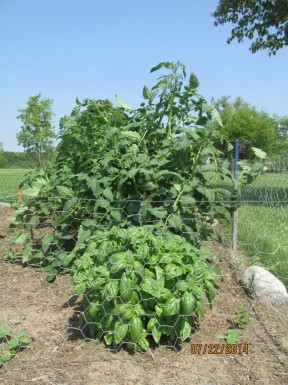 Up went a 2 foot high chicken wire fence and the rows replanted. Once again all was fine. We have so much green space around us that even though the ground hogs could easily burrow underneath…they did not. Another successful year of enjoyment. Now I believed I had the formula. The season began a bit later this year due to mother nature, but the seeds were sown once again with love and anticipation. The fence was up and now time was working its magic. Soon the shoots began to surface and one evening after a hot day, I watered my beautiful plants. As my husband and I sat on the patio enjoying the evening and our dinner, I looked down towards the garden to see the groundhog family out munching on the surrounding lawn as normal. Then my eye caught activity in…was it true…the garden!!!!?? I leaped up and ran like a crazy woman to the garden and sure enough, every single freshly watered shoot was eaten to the ground, even a 10 inch high tomato plant! This was not good – I was not happy. They had in fact burrowed under a section of the fence to enjoy the different varieties of greens. Now what do I do? We were already much further along the growing season and time would not permit the replanting of certain items like the carrots (my favourite). I realize that we no longer have our dog or outdoor cat who likely deterred some of this behaviour in the past. 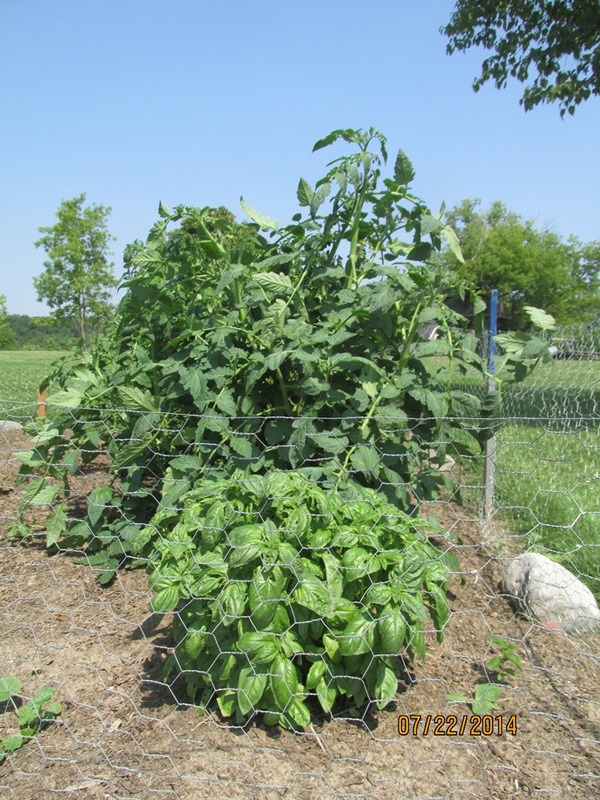 I could have just let it go for the year and enjoyed the fresh produce at the farmer’s markets, not worrying about all the extra time, love and care it takes to nurture a garden. Somehow, that was not acceptable to me as we now know the difference in taste and nutritional value of having our own produce. I decided to salvage what I could. So – the fence was reinforced; I replanted some items and went out to purchase a few pre-started plants. While it is definitely a paired down version of last year’s variety, we are well on our way to enjoying the fruits of our love and labour. We have enjoyed the herbs, some first cherry tomatoes, and a couple of zuccinis. Life has set-backs and it is always an opportunity to build our character. We get to look at what is important, what is worthy of our time and energy. What is the Joy Quotient it brings? What set-backs have you experienced that developed character? I’d love to hear from you. Share your stories with me. Don’t forget to leave a link back to your own blog too if you have one. 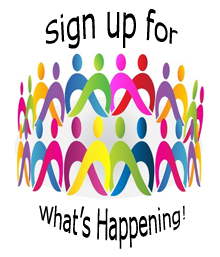 You can reach me by phone or email, leave a comment right here on the site or click the contact tab at the bottom of the screen if you are reading this post on the website. Hi Karen. I was just munching on a homegrown cucumber (the third so far this year) as i found your blog in my inbox. Was just outside in the garden thinking about how lucky we are to have such a lively cucumber patch this year despite the cucumber beetles (which killed all my plants last year). Thanks for the ever-timely and inspiring posts. LOL – this makes me smile as I reflect on the conversations we have had about gardens and critters. I’ll share what I can with you this year and who knows – maybe we can have a sleep over spring planting weekend next year. Thanks for sharing. I love the look of your basil. My looks really poor this year. It has been too cold and wet and it is quite distressed and stunted. But I could not agree more. It is still worth the effort. Other vegetables like peas, lettuce. potatoes, garlic are doing really well this year. I hope to have a good crop of carrots too. Just planted the late fall crop, so I should have plenty to share. Gardening has become a most enjoyable part of my (semi) retirement life. We built the beginnings of our vegitable garden last, learning by doing, all went well like yours, other than we planted way too much, those seeds are so small! This year the rabbits found our patch and breakfasted on our beets and carrots. My fence is now up and the second seeding is protected. However the squirrels (which we seem to have about twice as many this year) have cleaned out two pear trees of all the tiny fruit, don’t they know it gets bigger and better if they wait. Waiting and watching patiently to begin to enjoy the fruits (apples only this year) of our effort. Hopefully the tomatoes will be blight free this season. Two of my beds are raised and the animals have avoided them, except nut burying by the squirrels. Great to hear from you and know that you are still enjoying the semi-retired life style. It is pretty tricky working with mother nature – I think it keeps us on our toes. I think it says something about the quality of the food when everyone is interested in it. I also notice that the little critters I think are so cute don’t seem so cute any more unless they are somewhere else! lol. I hope your tomato harvest is bountiful – wishing you both a great summer too! Ho’Oponopono What is the Message from the Red Tailed Hawk?